LGBTQ students are more than two times as likely to be verbally harassed or bullied at school than non-LGBTQ students. Learn best practices to build an inclusive school climate where all students are welcome. Compare your current school and/or district policies to examples of best practices in school-based scenarios. 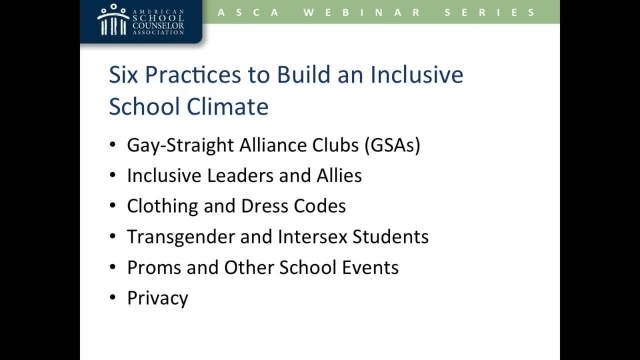 Use this information to establish policies that are inclusive and safe for LGBTQ students. Download accompanying handouts. Analyze and compare current school and/or district policies to best practices. Using best practices as a guide, formulate policies and procedures for your school that are inclusive of all students.